VFL R2 in 60 seconds Get a snapshot of Collingwood's second round loss to Essendon in 60 secs with Collingwood Media. Defender Jonathon Marsh was left without the help of Tony Armstrong and Darcy Moore in the backline at Windy Hill on Sunday. Collingwood’s 32-point VFL loss to Essendon at Windy Hill has been further soured by injuries to defenders Darcy Moore and Tony Armstrong. The Magpies rotation and defensive structure was dealt a blow early in the match as Armstrong left the field with a knee injury in the first quarter. Already one short in the backline, Moore sent scares through Windy Hill when he clutched at his hamstring in front of the Collingwood bench in the final quarter. He was able to walk off the ground but immediately disappeared into the change-rooms. “We don't know the extent of it as yet. We're hopeful that it won't be too serious," Collingwood Director of Football Neil Balme told Collingwood Media post match. Collingwood VFL coach Dale Tapping spoke to Moore after the game and is hopeful the injury isn’t too severe. “I spoke to him before. The physios don’t seem to think that it’s extreme. But obviously scans will give us a clearer picture,” Tapping told Collingwood Media. Prior to leaving the ground, Moore engaged in an intense battle with Essendon’s Shaun McKernan. Despite only gathering four disposals, the 19-year-olds defensive pressure troubled the Essendon forward. 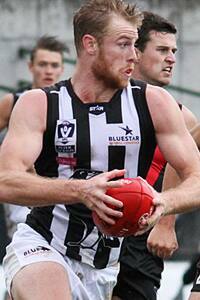 Tough conditions greeted Collingwood again after a trip to North Ballarat last week. Rain was prominent in the first half as a wet and slippery ball limited scoring. In his first game since injuring his hamstring last year, Clinton Young got the Magpies on the board with a goal in the opening quarter. Young shifted to a position in defence after the injury to Armstrong but still managed to find the ball 18 times and had five inside 50s. Patrick Karnezis led all possession getters for Collingwood with 29 touches as he settled into a role as a loose man in defence. It was this extra number back for both teams that prevented the Magpies from breaking open the scoring. Despite having eight more inside 50s then the opposition, the Magpie forwards failed to convert, with a number of tough chances leading to 18 scoring shots producing just five goals. Tapping believes the inaccuracy on goals came from a combination of missed opportunities as well as a strong Essendon defence. “We just wasted the opportunities… we were a bit messy going into our forward half,” he said. Jordan De Goey once again proved he is more than capable of standing out in wet conditions as collected 20 disposals to be Collingwood’s best player. Karnezis and ruckman Jarrod Witts were also named in the best, alongside VFL listed trio Jake Williams, Gus Borthwick and Ben Moloney. After two games on the road, the VFL Magpies will return to Victoria Park next Saturday when they clash with reigning VFL premier Footscray.